You may use essential oils for their internal health benefits, but did you know they can also be used to maintain healthy hair and promote hair growth? Whether you have dry damaged hair or oily hair follicles, essential oil for hair is a wonderful and natural way to combat hair loss, dandruff, and even premature graying. Before your next hair treatment, learn the unique properties of several essential oils. For many of us, a fine-tuned hair care regime is crucial and part of our weekly, if not daily, tasks. Our hair can take a beating every day from environmental pollutants such as dust, smoke, and wind. The hair products we use and the heat from hair appliances can cause damage as well. Essential oils help to promote good blood circulation even in the scalp, and can aid in the hair growth process. As the oils are distilled directly from the plant, they contain potent properties and should be combined with a carrier oil such as coconut, jojoba, or almond oil before applying directly to scalp or skin. As the properties of various essential oils target different ailments and health benefits, different types of hair respond to different essential oils. 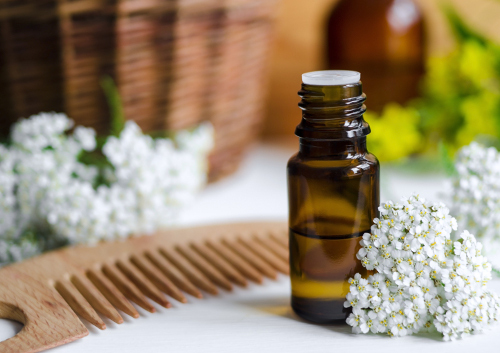 People with sensitive skin or scalp diseases should take extra precaution when using essential oil for hair care. We will discuss the property benefits for hair growth of 12 essential oils. Known as the best essential oil for hair growth, rosemary oil also helps with premature graying with its antioxidant components. By stimulating hair follicles and promoting blood circulation, rosemary essential oil regulates sebum production and prevents flaking. It is recommended for those with oily hair strands. Hair growth is encouraged by the grass plant of vetiver. Along with its antioxidant components, vetiver is thought to work as a stress reliever by calming the mind and scalp. It is used to treat premature baldness and premature graying. Any type of hair can benefit from the sweet oil of lavender, especially a combination of oily and dry hair. Its antibacterial, antiseptic, antimicrobial, and antifungal properties moisturize the scalp to prevent dandruff, and it heals scratches or acne on the scalp as well. Lavender helps to regulate the sebaceous glands and sebum production, and promotes blood circulation. Thyme oil is an active ingredient in many natural hair products, such as shampoos and conditioners. While fighting dandruff, and promoting growth, thyme stimulates blood circulation and hair follicles. It should be noted that thyme has strong properties and should only be used sparingly and on occasion. It is best used in combination with lavender. Of the three forms of chamomile, Roman chamomile has anti-inflammatory components to target symptoms of itchy scalp, as well as flaking due to dandruff, psoriasis, and dermatitis. Use it to moisturize the scalp and prevent damage from pollutants. It can also be used to lighten hair color. Cedar essential oil is best for fine to normal hair, and to prevent hair loss. Containing antiseptic properties, cedar essential oil works against dryness that causes dandruff, and balances sebum production. When heated, it promotes hair growth by inducing blood circulation and the hair follicles. Losing hair? Clary sage has phytoestrogen properties thought to prevent hair loss and possibly even reverse premature baldness. It can be used on all hair types, as it tackles dandruff and balances sebum production. It is also great for taming those frizzy curls. Taken straight from the rind, lemon oil fights scalp acne, dandruff, and oily scalp with its antiseptic and antimicrobial properties. As we know, peppermint has a cooling effect. It is useful for the symptoms of dandruff and dry scalp. It allows the hair follicles to breathe and promotes sebum oil production and blood circulation throughout the scalp, as it does the entire body. Parents of school-aged kids know this is one of the best oils to prevent and treat lice infestation. Tea tree oil has antimicrobial properties to treat scalp acne, and can be applied as a moisturizer to the scalp. In fact, it is known as the best natural treatment for dandruff. Boost your hair volume with the properties of ylang ylang oil. It promotes the production of sebum oil to avoid dryness and follicle damage. It can also help to balance hormones that cause hair loss due to stress. Like tea tree oil, ylang ylang has been proven successful in treating lice infestations. Patchouli is an ancient Asian tradition tool for hair and skin. It has been used to promote hair growth, treat dry scalp, and fight inflammation. If you suffer from eczema, dermatitis, and dandruff, add patchouli to your hair care regimen. Essential oils can promote hair growth if used properly and diluted with a carrier oil. Once applied, it may best to use a shower cap or towel to cover your head during the time oils are on the scalp. You may even want to test a small patch of your skin for any possible reaction to the oil. Whether you leave the oil treatment on for 30 minutes or overnight, be sure to thoroughly wash the oils out of your hair, as they can build up and cause the hair to become heavy. Add 10 drops of rosemary oil to three tablespoons of warm olive oil as a cleansing solution for your pores on the scalp. Leave the treatment on for 30 minutes before washing it out. Repeat once every week for one month for dandruff control and to remove grease from hair follicles. Massage a solution of five to six drops of vetiver oil and two tablespoons of heated almond oil onto scalp. Leave it on for two hours, or for best results, leave it on overnight and wash hair in the morning. Combine eight to 10 drops of lavender oil with two tablespoons of heated coconut or extra virgin olive oil. Massage onto scalp and leave it on overnight. Lavender is also known for promoting sleep and reducing stress, resulting in a good night’s sleep. Use a treatment of two drops of thyme oil, five drops of lavender oil, and two tablespoons of extra virgin olive oil. Leave it on for 15 to 20 minutes. Be sure to massage the scalp before rinsing. Massage a combination of two tablespoons of jojoba oil and a few drops of chamomile oil on the scalp. This formula does not have to be removed with a wash. You can also create a regular hair rinse of one quart of water and 10 drops of chamomile oil. Add two to three drops of cedar oil to two tablespoons of coconut oil for a hair treatment. Wash out the oil after one to two hours. If your hair contains a lot of natural oil, add five drops of chamomile oil to one tablespoon of your favorite shampoo. Mix equal portions of jojoba oil and clary sage for a 30-minute treatment. You can also add moisture to extremely dry hair by using a solution of one to two tablespoons of coconut oil with 10 drops of clary sage. Use a hair brush to coat all hair stands and follicles. Get the benefits of eliminating excess natural oil from your hair by adding lemon oil and warm water for a rinse. Repeat with a plain water rinse to remove the lemon oil. You can also add five to six drops of lemon oil to two tablespoons of jojoba oil to create a scalp treatment. Leave on for one or two hours before rinsing. Add five drops of peppermint oil to five drops of lavender oil and two tablespoons of heated coconut oil. Use this solution as a massaging treatment, and leave it on the scalp for 15 to 20 minutes. Add two to three drops of tea tree oil to one or two tablespoons of coconut or sweet almond oil. Massage it onto the scalp, and rinse after leaving on for 15 to 20 minutes. Treat hair to a combination of five drops of ylang ylang oil and two tablespoons of heated olive oil. Massage it onto the scalp, and place a wet towel soaked in warm water on the head during the one-hour treatment. This will promote absorption of the oil into the scalp. Combine two to three drops of patchouli oil and five to six drops of rosemary oil with two tablespoons of argan oil. Apply the mixture to the scalp for a one to two-hour treatment before rinsing. By adding lemon or lavender oil to the water rinse, you can lower the overpowering aroma of the patchouli oil. We have gathered a few essential oil recipes in addition to the use description of each oil. These recipes will promote hair growth, help with premature graying and balding, and stimulate blood circulation of the scalp. Mix the oils together and massage the mixture onto the scalp. Wrap the head in a heated towel to keep the oils warm. Combine all ingredients and massage mixture thoroughly onto the scalp. Please note that pregnant women should avoid adding sage. Combine all oils and massage mixture onto the scalp. Wash hair after application. Mix all ingredients in an airtight jar and apply onto scalp every night at bedtime. Rinse your hair in the morning with cold water. If you have oily hair, use this treatment only two to three times per week. The amazing properties of essential oils have been used for centuries for promoting healthy skin and hair, as well as for internal health conditions. By understanding the power of each essential oil, you can boost your hair volume, and control issues such as dandruff and possibly even hair loss. Remember to use carrier oils to dilute the strong potency of many of the essential oils discussed, and be sure to test a patch of your skin if you have sensitivity to certain properties. “Best Essential Oils and Recipes for Healthy Hair, Hair Loss and Hair Growth,” Essential Oils Benefits, February 13, 2016; http://essentialoilbenefits.com/best-essential-oils-and-recipes-for-healthy-hair-hair-loss-and-hair-growth/, last accessed March 22, 2017. “Wave Bye-Bye to Damaged Hair,” Web MD; http://www.webmd.com/beauty/natural-oils, last accessed March 22, 2017.